My blood felt different again, for the second time this night. However, this time it throbbed with power. Power the likes of which I had never felt, power that meant me no harm; power that was at my command. The War Council dispersed with the Prince asking us to remain in the city until the crisis abated. It made sense. A cell in the basement was already prepared for me, and I felt it prudent to go rest and come to terms with what was coursing through me. Walking through the keep I noticed that the conversations of distant servants came to my ears if I willed it. I merely had to focus and I could read the lettering on a bible half a church away, so long as I could see the book. I felt a spring in my step, and power in my limbs. Interesting. Dawn was approaching so I took my cot and hoped for a dreamless, restful sleep. My hopes were partly in vain. I became aware of darkness, and dread clutched me once again. I tried to call, hoping my being in a holy place might help, however no sound escaped my lips. I listened for the mocking laughter and I looked for the black feathers. I heard no laughter, despite my hearing being better than before and I saw no feathers. However, I was not alone. Approaching from the depths of the darkness was a speck of light. Bright powerful, angry, light and it was coming towards me at high speed. I tried to move and yet I could not. My limbs flailed and I moved nowhere. As the light got closer I realised it was a creature running on four legs. Something in me knew it was a predator. What power or trickery from Chax was this? And yet, I felt none of the foreboding of my previous prison. I felt the creature, the beast, radiate power. It could run and walk in this dark realm, and now it was circling me. It had four legs of vibrant, violent light. Its head reminded me of a dog or a wolf, and I could smell blood from it. It padded over to me and placed its face against mine, eye to eye and I knew what it was. It was me. Or, more accurately, it was my beast communing with me. It had tasted Emrick’s blood and awoken from the place I confine it. Something was different about it this time. Every time I have felt it stir before it has exhibited two emotions. Fear, or Rage. This day it was excited and curious. A paw swiped at my head triggering part of my brain. I felt its energy flowing through my limbs, and watched it run away from me faster than its approach. I must chase it, I could chase it. No longer held in place I ran after the creature, my limbs surging with the energy; I was much faster than before. My coordination was better and I was fast enough to catch it. The Beast turned and flew at me, biting into my shoulder with more power than any wolf jaw. I felt pain, though there was no wound. And then I realised the power had sparked in me, yet again though this time it felt different. The power flooded to my arms and fists, and when the creature flew at me again, I struck it with such power it recoiled into the darkness. I sensed it summoning the anonymity. It was out there, lurking. I hunkered down into a crouch to add stability, made easier as my balance appeared to have improved along with my speed. I probed with my newfound senses, not finding the beast. And then I sensed a ripple of anonymity as it appeared behind me. However, it was more. The beast shed the cloak and it was replaced with something else. The creature now wore something akin to a beacon, that drew attention to it whilst sending a message to all that saw it. The message was “fear me”. The beast was teaching me how to use the Prince’s gifts, all of them. I reached for my cloak, but before grasping it I tried to shift my perspective from anonymity to exposure. There was a different cloak waiting within my soul, which wrapped itself around me projecting the idea of “Resolute”. The creature began circling, so I moved to keep its gaze. The cloak I now wore shifted from a shimmering form into energy, pouring into my head, behind my face. I could feel its power forming behind my eyes and my teeth; concentrated, primal fury building in a reservoir not big enough to contain it, it bulged within, demanding to be let free and I was happy to oblige. I released the fury, whilst holding the gaze of my beast, and snarled a mighty snarl. No snarl is friendly. When a creature snarls it is telling you it is ready to bite and kill, so every creature has within them the survival instinct to back away. This snarl, fuelled by the powers of Caine, fuelled by the blood of Emrick and channelled through my now obviously vampiric features, hit my beast with such power, such ferocity, it yelped in terror and fled back into the darkest parts of my soul. Once, not long ago, I had naively asked Emrick for this power. I confess, I was unprepared to channel such fury, such primal anger. It scared me a little. Though I am forced to admit, I felt more at home in my flesh than I had for a long time. I woke feeling energised. I felt that I could crush stone or outrun cavalry mounts. I felt like I could force fear into the bravest heart and make them cower away from me. The beast sent a tingling sensation of approval, though skulked back into its shadow haven within my soul when I let my displeasure be sent back its way. Such fury would be reserved for times when I must avoid fighting, or when it could spare lives. I am no monster. There was a knock at my cell, and I found Dandrain waiting patiently outside. That man never sleeps, I swear it. He had a tray with a decanter of human blood for my sustenance. The Prince and his court are nothing if not exemplary hosts. I thanked him and decided I would make use of my time here and started climbing the stairs to the main library. I had not gotten one flight up before the bell of the Cathedral started ringing. In the distance I could hear a commotion, so decided this might be a good opportunity to test my new senses. I stretched out my hearing and could hear boots running on stone, and men shouting to muster in the yard. I searched other areas of the cathedral with my hearing and I found Dandrain. I guess Chax must have decided it was time to come and play some more. I hurried to the courtyard, and found the Prince, the guard and the Elders assembling. Menw appeared at my shoulder. I felt the beast rising. I didn’t stop it, though I turned my new beacon inwards upon it. I communicated I was master. It accepted, just happy that it was going to get to fight. Nodding to Menw, I hurried to the east gate, and I saw there were already archers and spearmen on the battlements and in the windows as discussed. The remainder of the court mustered to their allocated places, before vanishing from sight, leaving Ettori and I to make small talk. Ettori looked at me as if I was crazy. I shrugged. I am severely out of practice regarding small talk, and forcing it wasn’t natural. Though, after what happened next I would gladly have tried. “I do so enjoy listening to your conversations, Ethan.” The voice came from the darkness within. It was Chax, and he had been listening to me the whole time. He knew everything. “He knows our plan, he can hear me,” I said. Ettori was impassive then his eyes widened, and his body went rigid. He must have heard something too. In the distance I heard howls. Gut wrenching, blood curdling howls. Howls from many beasts. Ettori was right, Chax was not coming alone. Men on the battlements were looking out across the lands, pointing. Even if I could not hear their voices, I would have sensed their panic. And then I heard a sound like approaching thunder. Beasts, and I mean lots of beasts hurried towards Cardiff. I couldn’t see them, but I could hear them, smell them and heard the words of the guards. And then I heard scraping and gouging as they ran up the walls, cresting the parapets. Howls were replaced with screams of fear as the city guard came under attack by a wave of dark scaly flesh, teeth and talons. I wanted to rush to help, so did Ettori, but Menw spoke again. Wave after wave of the creatures poured over the battlements, stopping only briefly to kill whichever guard happened to be in their way at the time before surging into Cardiff. The beasts ignored Ettori and I surging into the streets. And then, plummeting from the sky with the speed of a falling star, was Chax. He no longer looked remotely human, having flesh the colour of coal, feet replaced with cloven hooves and horns larger than any beast on this planet. His wings were pointed straight up to land, and so he did. Right on top of Menw, crushing my elder to the ground, revealing all of our hidden forces. I looked on at the creature in dismay. If it could defeat an elder in one strike, what hope did we have? 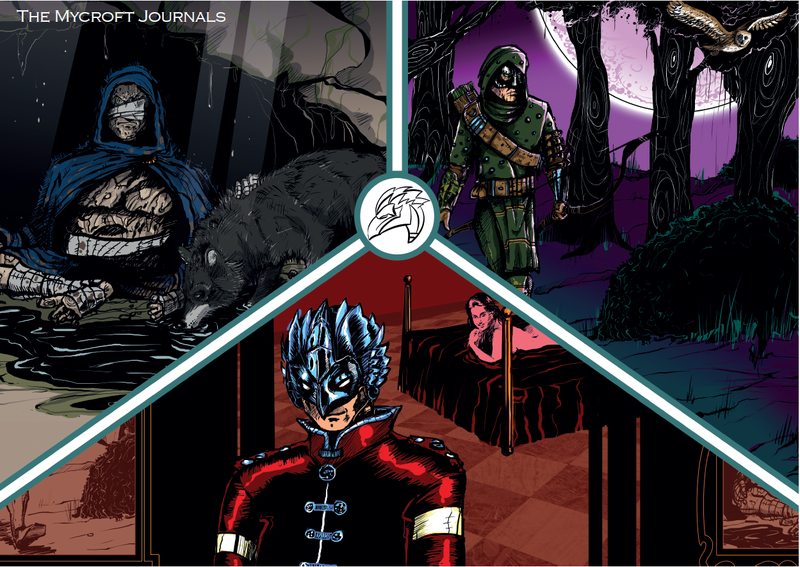 The Mycroft Journals is a serialised fiction, written in response to a roleplaying game I play in. It serves multiple purposes. It acts as a permanent reminder of what happened in the story (so, it helps us players), it acts as an advert for the game, and I think our Games Master has provided us with a compelling story, which other people should get to experience. Whatt??!! Menw is dead? Just like that? Whoa. Chax must be really powerful. What will they do now? I don’t think they stand a chance. However, I’m glad Ethan is now more in control of his beast. You know the answer to that now.